Happy Halloween everyone. I hope you have the more amazing scarefest! I'm still struggling to come to terms with the fact Wagamama's been around since 1992 and I've only heard of the place in the last year or so. Wagamama only came to my attention after watching Youtube and seeing the likes of Zoe Sugg and Alfie Deyes regularly ordering from there. Wagamama is a Japanese eatery and a blooming good one at that. I've never actually eaten Japanese food and now all I keep thinking about is how I want to go back and try more of their menu. I love my food, me, and always up for trying new things (depending on what it is) and the menu is certainly quirky and different. It's been a little over week since Wagamama was introduced to the Trafford Centre and I were happy to go along and lose my Wagamama virginity. 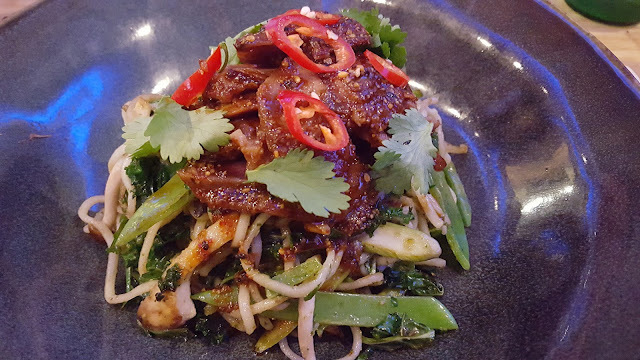 I ordered the Teriyaki Lamb which is; grilled teriyaki lamb with mushrooms, asparagus, kale and mangetout served on a bed of soba noodles in a pea, herb and wasabi dressing - it was so good and very filling. I also got a fresh, tropical juice of apple, orange and mango. It cost just short of £20 which I don't think is bad at all. The service was good and the employees friendly enough. My only pickiness would be that my meal didn't come until my partner was half was through his and had it not been for his side order of ribs we would not have finished at the same time. Do I recommend Wagamama? A hundred and ten percent. In the comments below leave me your Wagamama recommendations and I will try them next time I go. I love Japanese food, although we have yet to find a good restaurant since we've been in Germany!